This is the perfect infuser for making tea by the cup. You simply set it in your cup while the tea is steeping, and remove when the tea is ready. It’s made of a very fine stainless steel mesh with BPA-free plastic housing. Even fine rooibos tea won’t get through this filter! 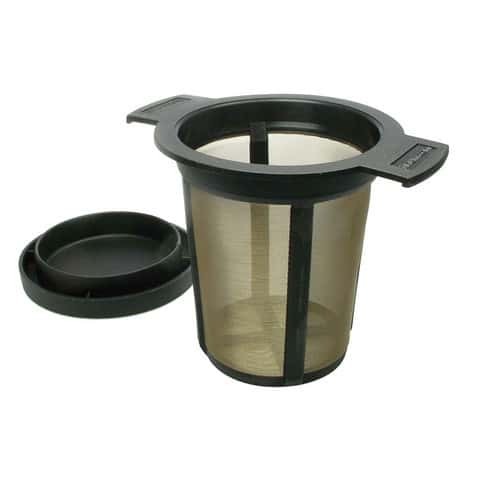 The infuser comes with a lid, which keeps the tea hot as it’s steeping, and also doubles as a drip tray when infusion is complete. Fits most teacups, mugs, and teapots. Dishwasher safe. I really like that the mesh in this infuser is really fine. The container is large enough to let the tea expand. It fits well in my cups and in my tea pot. I also like that it is NOT made in China but is made in Germany and imported by a company in Milwaukee. It is also BPA free. Tried mine out Saturday and I absolutely fell in love with it. You can strain the loose leaf with it, you can use it in a pitcher. I set it in the pitcher to make cold tea and when it was done, I left some of the leaf in the tea but it also strained the bulk of Almond Rooibos (kept the almonds in tea.) I needed this. I am very happy with the results and ecstatic over the tea’s taste. It left no after taste and effortless cleanup. I could have asked for a better strainer. It’s fantastic. I have had this infuser for over 8 years. It get a bit stained up, as I brew mostly black tea, but other than that, it looks brand new! I have tea almost daily.